Alex Davis, IVARO Manager, discussing legacy considerations and planning for the onwards life of your artwork. Gilane Tawadros, CEO DACS, discussing the DACS Art360 Initiative – a project which is offering support to develop and sustain the archives of 100 leading modern and contemporary British artists. Robert Ballagh, IVARO Chairman, discussing his 40 year career in the visual arts. 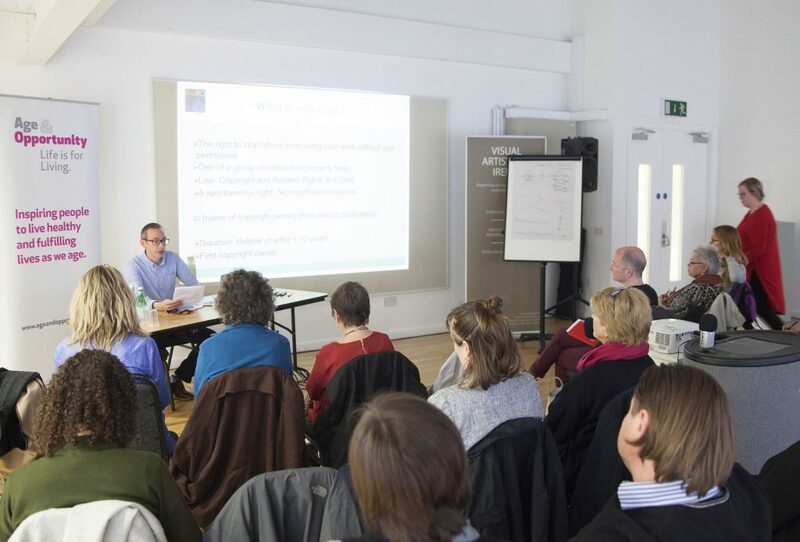 A day long series of talks looking at ways and means of licensing the use of creative work aimed at visual artists, illustrators and designer makers. Contributions from gallerist and consultant Patricia Clyne-Kelly, illustrator Steve Simpson , solicitor Brenda Tobin, Siobhan Riordan (MD of Alan Ardiff Jewellery) and Alex Davis, IVARO. World Book and Copyright Day is celebrated on 23 April. This date was chosen by UNESCO as it is also the anniversary of the death of both William Shakespeare and Miguel de Cervantes. To mark the occassion, IVARO took part in a day long event for artists in Malahide Castle, speaking on the topic of copyright and appropriation art. This event was organised by Visual Artists Ireland and Fingal County Council Arts Office. A one-day informal symposium on all aspects of collections and collecting. Elizabeth Kirwan, National Photographic Archive; Alex Davis, IVARO; Leszek Wolnik, The Copper House Gallery; and Dónall Curtin, collector. The keynote speaker was Francis Hodgson, Photography critic for the Financial Times, co-founder of the Prix Pictet Prize and formerly Head of Photographs at Sotheby’s. Visual Artists Ireland in association with the Bar Council of Ireland. An event bringing together artists and legal professionals to highlight some of the key art law issues that perennially arise for artists and examine the best ways to deal with them. David Langwallners presentation on copyright and Henry Lydiates presentation discussing the legal needs of contemporary artists are available here. IVARO hosted Copyright Night in the James Joyce Centre. This was a free information session for visual creators on how best to exercise their rights under copyright law. It was also the occasion for the launch of RETURN which is IVAROs’ reprographic royalties service for artists whose works have been published in books, magazines and journals.